Celtic Submari will appeal to all those interested in the power of goodness, decency, integrity and friendship to make a positive difference in a complex world through football. 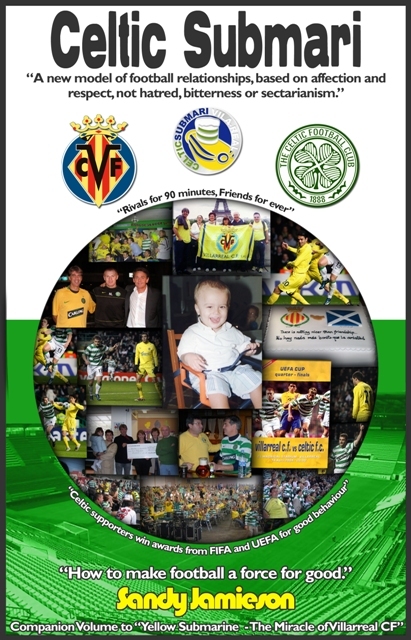 The book explains how an invasion of Vila-real by 10,000 Celtic supporters in 2004 created a set of circumstances that has led to a lasting friendship between supporters of Villarreal and Celtic. This friendship is unique in world football and offers the wider football world a model of camaraderie and togetherness that shows how football can be a force for good. Celtic supporters everywhere can take pride in the story of how their example of camaraderie and good behaviour in 2004 inspired the formation of the Villarreal Celtic Submari. The Submari has proved to be an extraordinary example of the way in which decent people can help others through football and friendship. 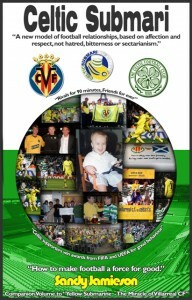 The remarkable friendship between Celtic Supporters and Villarreal supporters has continued to grow, and inspire, many years on. Celtic Submari also explores why the subsequent visit of Glasgow Rangers to Villarreal did not result in a similar outburst of mutual friendship but saw instead Rangers fined for the poor behaviour of some of their supporters. This book investigates the cultural differences between Celtic and Rangers supporters which explain their different behaviours abroad. It offers an enhanced understanding of some of the elements of the sectarian sourness that so scars Scottish football. It puts forward radical solutions drawing on the Villarreal Submari model. It shows why both Celtic and Rangers supporters need to learn from the model practiced by the Villarreal Submari if Scottish football is to eradicate its sectarian sickness.